Mariota’s future more like McNair or Locker? 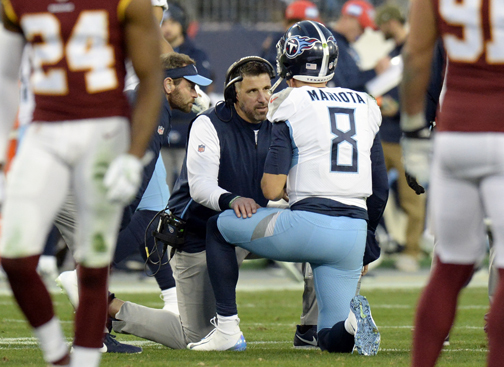 Titans head coach Mike Vrabel talks with quarterback Marcus Mariota after Mariota was injured in the first half against the Washington Redskins on Dec. 22. The arm injury, his second of the season, kept him out of Sunday’s loss to the Colts in a matchup for the final playoff spot. The Tennessee Titans head into an offseason full of questions after Sunday night’s elimination loss to the Indianapolis Colts. Chief among those concerns is quarterback Marcus Mariota, whose absence Sunday night did nothing to clarify whether he will continue as the face of the franchise. Once news leaked Sunday morning that Mariota would not be able to play in the most important regular season game of his professional career, the reaction and speculation ran rampant on social media. Fans speaking with their two-tone blue hearts wondered why a stinger injury could keep Mariota from playing in such a big game. Of course, playing in the shadow of Steve McNair – he once tried to play through a cracked sternum – can make it hard on any quarterback in a Titans uniform to sit out with any injury that does not require crutches or a hospital bed. But if the reports that Mariota perhaps risked permanent nerve damage if he suffered another hit to his throwing arm are to be believed, then not playing was really the only sensible call. No one game – playoff implications or not – is worth jeopardizing your quarterback’s long-term health. And while the news that leaked out Sunday morning sent shock waves through the NFL and Titans Nation, it appears those inside the walls at St. Thomas Sports Park knew all along that Mariota’s availability for Sunday night was suspect, at best. “We kind of had an idea what was going on,” rookie linebacker Rashaan Evans said after the game. “They were still using him throughout the week. We were still kind of unsure of whether he was going to play. Veteran linebacker Wesley Woodyard said the Titans knew pretty quickly they would have to have contributions from other sources in order to have a chance in the play-in game. But beyond just Sunday night’s result, the latest chapter in the Mariota injury saga only adds more questions than answers. The Titans’ public message is Mariota has the ability to rise to the occasion and be a special player. But the injury issue continues to fester and will be the hot topic – yet again – of the Titans’ offseason. Teammates continue to swear by Mariota and his makeup as what a team must have in a franchise quarterback. “He’s a guy you want as your quarterback. We respect the hell out of him as an offensive line, and we’ll do anything for the man,” center Ben Jones said. “If he could have went, he would have definitely been out there. “Marcus is one of the toughest guys on this team and a guy you will lay it on the line for you anytime, and what he brings to the table, you know how much he cares about the team, and we love him to death. So, his teammates profess, Mariota is a warrior on the field. But can the franchise continue to pins its hopes on a quarterback who is off the field so often? Injuries have kept him out of the regular-season finale in three of his four seasons, and he has yet to make all 16 starts in a single season. And so we move to another offseason wondering if Mariota is the Titans’ best hope at quarterback. Is his courage in taking – and delivering – hits helpful or hurtful? Perhaps a bigger question is whether he’s the next Jake Locker, a first-round pick by the Titans in 2011 who played four-injury plagued seasons at quarterback before retiring to preserve his health.